The term “digestive disorders” is an umbrella term which includes many types of disorders, diseases and infections that may affect the digestive system and the gastro-oesophageal tract (digestive tract). Some conditions only affect part of the digestive system, whereas others might affect the entirety of it. Symptoms for most disorders are common and include diarrhoea, constipation, loss of appetite, abdominal pain, internal bleeding from ulcers etc. Indigestion is also included under this, but definition of the condition itself is very imprecise. It may be a disorder on its own, or a symptom for something far serious. How to take Manuka honey for Stomach Disorders? New Zealand honeys are famous for the many health benefits they provide, and one of the most well-known of these is Manuka Honey. This particular kind of honey is made by bees that take nectar from wild Manuka trees, thus giving it the name. Manuka honey has a lot of therapeutic value. Manuka honey contains a compound called methylglyoxal. This is a special compound not present in other kinds of honey, and is the reason behind the unbelievable number of medicinal properties exhibited by manuka honey. By the virtue of this compound, manuka honey is lended its antibacterial, antifungal, antiseptic, anti-inflammatory and immune boosting effects. Manuka honey’s medicinal properties improve digestion and remedy digestive disorders. Several enzymes are contained in manuka honey, which aid in faster digestion and take the stain off the gastrointestinal system. These enzymes help in enhancing the digestion specifically for carbohydrates and sugars . The digestive system breaks down substances in food into its smallest units, which can now be absorbed into the intestine. An additional benefit of consuming honey is that it contains sugars that are already in their smallest forms, which is monosaccharide and these are easily digested. Various components present in manuka honey aid in easier and faster digestion. The passage of honey through the stomach and intestine takes more time than that of regular sugars. As a consequence of this, honey plays a role in the mitigation of conditions such as diarrhoea. In clinical studies, it has been observed that honey intake by babies and infants reduced the frequency and duration of diarrhoea . However, due to botulism risk, it is advised to avoid giving manuka honey to children. The digestive system also contains a number of bacteria that are essential to digestion and very benefial to human health. These are collectively called “gut flora”. The population of such bacteria in our gastrointestinal tracts can be improved by consumption of foods that are rich in prebiotics, such as manuka honey . Manuka honey is effective in reducing diarrhoea and re-establishing a healthy gut microflora. Manuka honey contains potent antibacterial properties. This happens due to the presence of a compound called methylglyoxal. This compound is not present in all honeys, and is specific to manuka honey. This makes it effective against bacterial infections of the stomach, as it can directly affect the source of the disease and hasten the process of healing. Helicobacter pylori is a bacteria that is very common and causes digestive disorders in the stomach lining such as gastritis and peptic ulcers. Studies show that manuka honey could be effective in controlling the growth of this bacteria in the stomach, especially with some of the strains of the bacteria that have become resistance to the commonly used antibiotics . If left untreated, even simple infections can go on to cause serious conditions such as gastric and intestinal ulcers. Such is the effectiveness of manuka honey against bacterial infections in the digestive tract that it is being looked into as a potential source for pharmaceuticals as an inhibitor for bacteria to prevent infections from reaching that level of severity . In addition to Helicobacter, there is another bacteria known to cause a number of digestive disorders, such as diarrhoea and colitis, called Clostridium difficile. There are three different strains of this bacteria that affect humans, and manuka honey is known to be an effective against all three of them . Due to its methylglyoxal content, manuka honey has exceptional anti-microbial property and is effective in eliminating pathogens that cause gastric infection. Manuka honey also helps in boosting the immune system of the body, enabling it to provide a faster response against diseases. Manuka honey stimulate a specific type of white blood cell called the macrophage to produce certain compounds that help fight against the infection. This effect of manuka honey, a study claims, is due to the presence of special proteins in it called Arabinogalactans , and Apisimin . One of the compounds that is produced in large amounts is called TNF-α (Tumour Necrosis Factor Alpha) and this compound is extremely important due to its function in the regulation of immune cells. Components of manuka honey boost immune function which can help in fighting infections and other gastric disorders. Due to the anti-inflammatory action of manuka honey, it helps soothe any kind of inflammation or irritation on the lining to the stomach and the intestine. Based on the methylglyoxal content and other factors, manuka honey’s anti-inflammatory potential differs in different brands. Tomblin et. al demonstrated that manuka honey exerts its anti-inflammatory effect by acting through Toll like receptor pathway. This pathway plays an important role in cell proliferation, immune response and inflammation. Leong et. al demonstrate that manuka honey reduces inflammation induced swelling and prevents activation of inflammatory cells. Prakash et. al conducted a an animal study investigating the effect of different doses of manuka honey on inflammatory model of colitis. Manuka honey at low and high doses is effective in reducing inflammation in colitis and also restores antioxidant defences in damaged tissue. With age, certain reactive oxygen species accumulate in our body and cause damage to our tissues and organs. This is called oxidative damage. The organs involved in the digestive system are also affected by this, especially the liver. Manuka honey contains a number of anti-oxidant compounds. These help in preventing the oxidative damage done to organs and replenish the health of the cells. Manuka honey is believed to be viable as a supplement to prevent oxidative damage to the body. Antioxidant properties of manuka honey help it repair damage to the digestive organs and to the tract . Manuka honey’s anti-inflammatory and antioxidant effect aids in soothing inflammation of the stomach and intestine which is common symptom of many digestive disorders. In addition to this, manuka honey is also very effective against certain specific cases of digestive disorders. Dyspepsia is essentially indigestion in the stomach. It is a very common problem, and may be due to bad eating habits or may just be a symptom of a much more serious disorder such as gastritis or gastro oesophageal reflux disease (GERD). Manuka honey is considered beneficial against dyspepsia and is also used to treat the symptoms of the disease including abdominal pain and burning in the lining of the stomach. Dyspepsia may also be caused by some sort of infection. In such a case, manuka honey can be used due to its potent antibacterial property. Gastritis is the inflammation of the lining of the stomach. It can be caused due a number of reasons, but one of the most common causes is an infection by bacteria called Helicobacter pylori. Studies show that manuka honey is extremely effective in the elimination of this bacteria from the digestive tract. It acts as an anti-inflammatory agent, and soothes the lining of the stomach all the while directly attacking the source of the infection. In addition, it also stimulates the immune system to provide a stronger and faster response to the disease. Acid Reflux, or Gastro-Oesophageal Reflux Disease (GERD) is a condition where the hydrochloric acid from the stomach leaks into the oesophagus. It may cause burning and inflammation of the oesophagus. Manuka honey, in combination with other natural medicines, can be considered for treatment of acid reflux, due to its anti-inflammatory and anti-bacterial activity . Inflammatory bowel disease is the inflammation of the large intestine. Manuka honey is effective against IBD in the same way that it is against gastritis. Its potent anti-inflammatory properties protect the lining of the large intestine from severe damage, and it triggers the immune cells into action to fight the infection. In this case, the causative organism is Clostridium difficile. A recent study discovered the role of manuka honey against this particular bacterium. All three strains of this bacterium can be controlled by the use of manuka honey as a therapeutic agent for colitis . The effectiveness of manuka honey is due to its inherent anti-bacterial properties. Ulcers occur when the lining of the tract is damaged and the tissue lying under it is exposed. Ulcers are essentially open wounds in the digestive tract. The use of manuka honey in the treatment is relatively well known. Manuka honey stimulates the process of wound healing and repair by triggering the white blood cells known as monocytes to release cytokine compounds. This enhances the rate of tissue repair and mitigates the problem. Consumption of any kind of contaminated food can result in a condition called food poisoning. The most common cause of food poisoning is a bacterial infection. A bacterium that is well known to cause food poisoning is Staphylococcus aureus. Such an infection resulting due to the presence of Staphylococcus is called a Staph infection. Manuka honey, when used together with antibiotics, enhances anti-Staph activity by 22% and promotes the elimination of this bacterium from the body . Therefore, it is an effective agent that can be used treat food poisoning resulting from severe bacterial infections. No specific dosage for any condition is given for manuka honey. 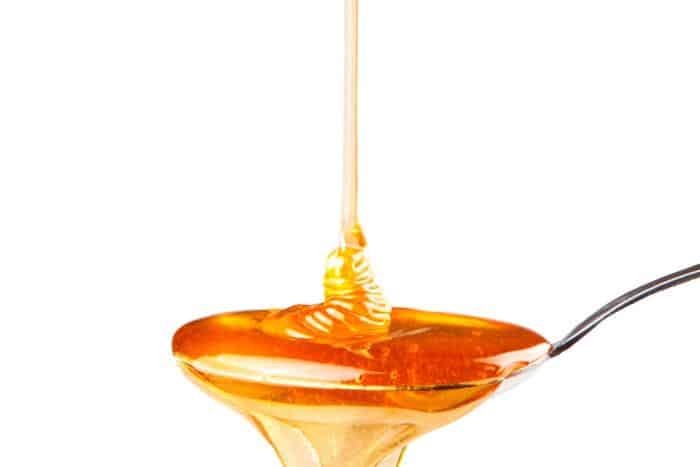 A study conducted on people in the age group of 42-64 concluded that honey was safe for regular and frequent consumption and had no observable adverse effects on the normal health of the body . 1 teaspoon manuka honey daily 3 times a day in between meals is recommended for best results . The most effective way to take it is straight from the spoon, but it may also be taken in cold or lukewarm water. Taking it with hot water is not a very good option, as the temperature degrades some of the beneficial properties of the honey. Diabetic patients can also take manuka honey, but in lesser amounts and with a strict check on the blood sugar levels at all times. To improve palatability, manuka honey can be consumed with a drink such as lemon juice. Lemon itself has antimicrobial and antioxidant properties, and aids manuka honey in soothing our digestive tract . Some people may be allergic to honey. Hence a patch test 48 hours prior to consumption is recommended to avert possibly dangerous situations. This allergy is more common for people that already suffer from bee or pollen allergy. Children below the age of 12 months should not be made to consume manuka honey, for fear of botulism poisoning due to some of the compounds present in the honey. Store bought manuka honey always has a UMF (Unique Manuka Factor) rating based on the amount of methylglyoxal present in the honey. For best results, always a rating of 10 or higher should be used. Manuka honey is an effective remedy for most digestive disorders. Its anti-inflammatory and anti-microbial effect can help in treating many digestive disorders such as GERD, gastritis and inflammatory bowel disease. How and Why Coconut Oil Helps in Inflammation?